It’s 2070, and our democracy is flourishing in ways we planned for, and in ways we never dared hope for. Today I’ve been asked to reflect on how we got here. First, to remind us all where we’ve come from, let’s take a few minutes to look back to the state of our democracy fifty years ago. In 2018, one third of New Zealanders, and nearly half of Māori, rated their trust in parliament as low and felt the public had little to no influence on government decision making. So it was unsurprising that in the 2017 election across all age groups, a higher percentage of Māori did not vote when compared to non-Māori. This was especially stark in the 18–24 yr age range where 38% of enrolled Māori did not vote. Political scientists at the time described this as the ‘inequality spiral’ in which people who were least well served by a society — poor, marginalised and excluded — had little reason to vote. Politicians, in turn, had more incentive to prioritise policies that would improve the lives of people who vote, creating a self-perpetuating cycle of neglect, distrust and disengagement. In retrospect, 2018 felt like a watershed moment, would we find a way to break the cycle of distrust and disengagement? Or would it continue to spiral towards an increasingly divided, disengaged and unjust society? At the same time, in 2018 digital technology was permeating society presenting both opportunities and threats to our democracy. The opportunities included the potential for greater openness and transparency in government, and more accessible, inclusive and customised pathways for citizen engagement — all opportunities I was enthusiastically promoting at the time. By 2018, however, the threats and risks were also becoming more apparent — in 2016 Brexit and the US elections had revealed how easy it was to manipulate digital platforms to distort public dialogue. We were seeing the impact deliberate disinformation campaigns could have on democracy when combined with the algorithms of the attention economy (what we came to call ‘viral deceptions’). Platform monopolies had already undermined the traditional funding model for public interest news content and fundamentally altered how information flowed to citizens. Public concern was growing about the harmful effect of social media — it’s addictive nature, online bullying, impact on mental health — and these negative impacts were distorting our public conversations, polarising our public debate and contributing to disengagement. This photo is from 2017. I chose it because it reminds me of the day when I had the privilege of witnessing something which I knew at the time to be important, and which I now believe was part of the beginning of the transformation of our democracy. 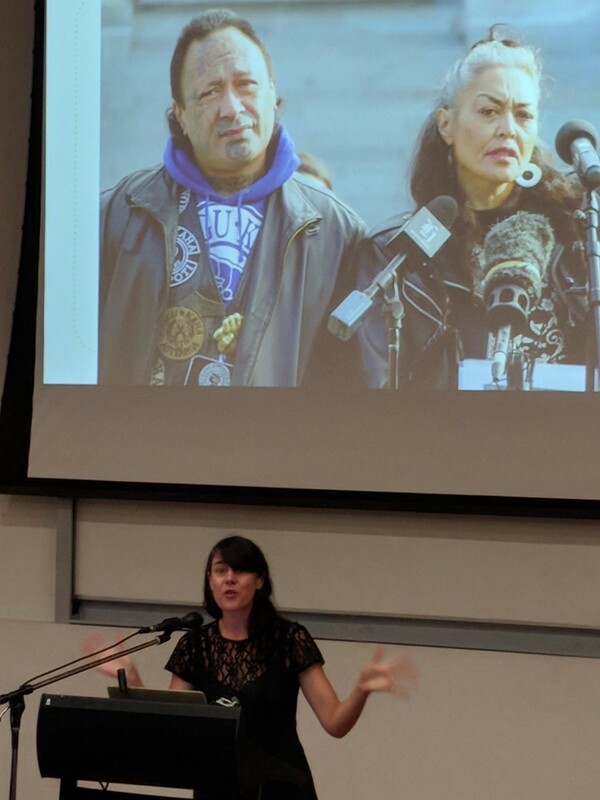 This is a photo of Ngā Morehū — two survivors of abuse in state care. They are standing on the steps of the old Parliament Building calling for a Royal Commission of Inquiry into the abuse they had been subjected to while in state care. That Royal Commission did happen, and in retrospect had a profound impact on our democracy. How? Firstly, by building a shared national understanding of how colonisation worked to undermine whanau and set off intergenerational trauma that not only planted the seeds for gang violence but also filled entire wings of our prisons with men and women who had once been children abused while in the care of the State. The Commission also deepened public understanding of the ways in which Te Tiriti o Waitangi had been comprehensively breached. Secondly, it brought to an end an era in which officials were instructed to prioritise protecting the Crown from potential liability, and ushered in a new era of radical accountability combined with care, creativity and compassion. It was a time when people whose entire previous experience of the State had been negative had a chance not only to be listened to, but also believed and redressed for the harm done to them. All of this helped to create the conditions for the massive decarceration project that kicked off in 2018, and has continued ever since, so that in the same way children in 2018 were perplexed by the idea of a world before the internet, my great grandchildren don’t believe me when I tell them we used to lock up tens of thousands of people in this country! These were bold — and as many at the time warned, risky — efforts to put right in a comprehensive way the wrongs of our colonial history. Combined with constitutional and institutional reform to properly recognise and respect tino rangatiratanga and the integration of te reo and tikanga Māori throughout the structures of kawanatanga, these changes have had a transformative impact on mutual trust and a corresponding impact on democratic engagement not only by Māori but by all people in New Zealand. It turns out the kuia and kaumatua were right when they told us what was good for Māori would be good for all of us. At the same time, kicking off at the meeting of D5 nations in February 2018, New Zealand took a proactive role in the global development of digital policy and infrastructure to manage both the opportunity and threats of those massive digital platform monopolies. That global co-operation resulted in regulation requiring digital platforms to provide greater transparency about political advertisers, to require thorough identity verification for ad buyers and to take steps to distinguish between trustworthy and untrustworthy sources of news and information. These steps — amongst other things — helped restore transparency and trust to public discourse. The government also invested heavily in public interest media. Some of you will remember 2018 as the year when what we once knew as RNZ began it’s transformation into the multi-platform digital media broadcaster that some of us nostalgically nicknamed ‘Radio with Pictures’. Alongside these efforts, a different kind of openness became the focus of our conversations about open government. We talked less about data and technology, and more about trust and the kind of empathetic listening and creative compassion that builds trust. Emboldened by the shift away from risk management towards empathy, accountability and responsiveness marked by the Royal Commission, public servants and citizens alike were given the chance to see each other as humans, to listen and to trust each other again. Which is how we got here. To 2070, where our democracy is not defined by the technology or even the processes we use to make decisions together but by our shared democratic values: empathy, trust, transparency, self-determination, care, collaboration and — of course — optimism. It’s enough to make this almost 98 year old hopeful for the future. Marianne Elliott speaking at Optimistic Futures event. Marianne Elliott is a researcher, strategist and storyteller who uses story-based research, and campaigning to influence policy. Marianne’s work translates complex ideas into clear, compelling narratives and tells stories that help shift the dial of public opinion to support pro-social policy. Marianne is co-founder of ActionStation, a vehicle for Kiwis who believe in a fair and flourishing New Zealand and co-director of The Workshop, a research, policy and storytelling collaborative.